Mental illness is often referred to as a disorder that causes changes in someone’s behaviors and emotion. It’s perceived as a disease that needs treatment. However, a West African shaman, Dr. Malidoma Patrice Somé sees mental illness in a completely different way. 1. Mental illness signals a person’s remarkable transformation in consciousness. According to Dr. Somé, depression, bipolar, psychosis, and schizophrenia are signals of a person’s remarkable transformation in consciousness. When the transformation is allowed to take place, there can be an enormous human development. 2. Mental illness is the “birth of a healer”. Dr. Somé and the Dagara people believe that a mental illness is the birth of a healer. In their tradition, a person suffering from such an illness has been selected by the other world as a medium to bring a message to the community. 3. Mental illness happens when two incompatible energies have merged into the same field. Dr. Somé says that mental, behavioral, and all other disorders suggest the presence of two different energies in a person’s body. When a person suffering from such an illness fails to acquire assistance from the spirit realm in dealing with these energies, disturbances take place. In the Dagara tradition where these people are seen as a bridge between the physical and the spiritual world, the community assists these people in reconciling with the energies of both worlds. If they fail to do this, they forfeit the birth of a healer and allow the initial disorder of energy to linger. The West’s lack of training in dealing with the existence of psychic phenomena and the spiritual world, lead them to label the person who fails to recognize what’s going on “insane”. As such, they treat this person with high doses of antipsychotic drugs, blocking what is supposedly the person’s spiritual evolution. 4. The screaming and yelling of the mentally ill patients signal that the “entities” try to get rid of the medication. Shamans and psychics have the ability to see “entities” or “beings” that linger in patients. After medication, these entities want to get rid of the medication out of the body by screaming and yelling exhibited by the patients, making them suffer from excessive pain. 5. Schizophrenia is an uncontrolled receptivity to a flow of images and information. While the medical world describes Schizophrenia as a long term mental disorder characterized by hallucinations and delusions, Dr. Somé describes Schizophrenia as having a receptivity to a flow of images and information, which cannot be controlled. 6. The Spirits trying to come through could be ancestors attempting to heal. Dr. Somé suggests that some of the spirits trying to come through from the other world could be ancestors trying to merge with a descendant in an attempt to heal what they weren’t able to do while in their physical body. 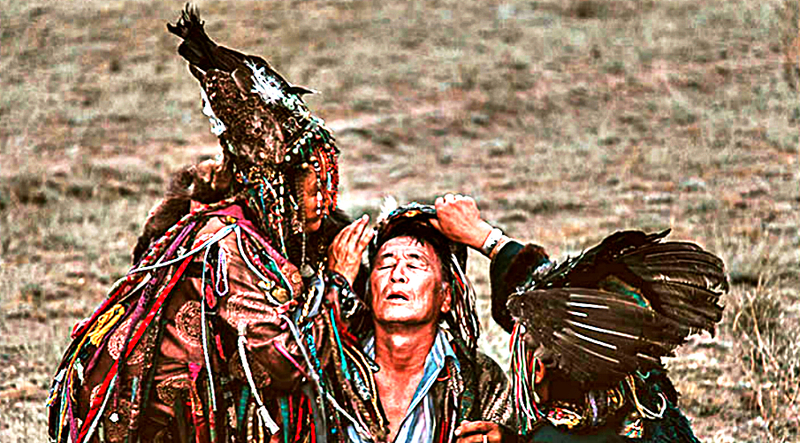 Having viewed mental illness from these perspectives, the shamans deal with foreign energies inside a person using the practice known as “sweep”. They clear these energies out of the person’s aura to calm the spiritual energy being received and calm down the person as well. After this, the shamans align the high voltage energy of the spirit that attempts to come through from the other world. The healer then is born. But in a situation where the birth of a healer is blocked, it’s then when problems arise and the situation gets complicated. There are also situations where the energy channeled is negative and don’t promote healing. In this case, shamans remove them from the aura instead of aligning them. Curious to know if his technique would apply to non African villagers, Dr. Somé took with him an 18 year old mentally ill patient back to his village in Africa. This boy has been hospitalized for 4 years and has suffered from hallucinations and severe depression. After his participation in Shamanic healing rituals for 8 months, the boy has been found to become quite normal. He acknowledged his healing gifts and continued to live in the village for another four years before returning to the US to complete his Psychology degree at Harvard. In conclusion, Dr. Somé points out that shamans can bring to the Western world the gifts of assisting individuals in rediscovering a spiritual point of view. Embracing the spiritual realm of life may decrease the likelihood of mental illness and see the patients as mediums called by the beings from the other world to assist with their healing work. Furthermore, this alternative and ritualistic approach to mental illness can open new opportunities and entirely change the lives of many people for the better.